Today is International Day of Happiness, so we’ve compiled 20 of our favourite quotes from writers about happiness, joy, pleasure, and related emotions. We hope you enjoy them! 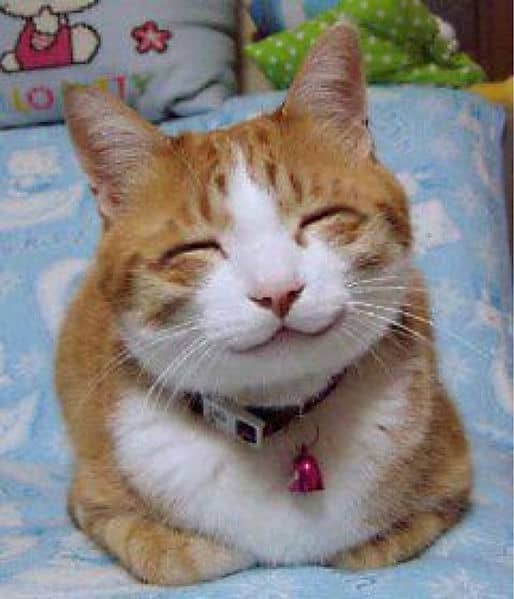 Image: Smiling Cat; author, Yumi Kimura, 2009; Wikimedia Commons. And sometimes just a smiling cat can get you there! I didn’t know there was such a thing as International Day of Happiness. Just by coincidence, today I posted a review of a book called Happiness. I love these quotes! You always have great posts! I love seeing them in my feed because I know I’m in for something good. Thank you – what a fine compliment! Well I’m very happy today because I’m celebrating my 21st wedding anniversary. Here are some thoughts from the Interesting Literature blog on the subject of happiness! Ah a reason for a day of happiness, forgive me if I share one of my favourites :) It makes me think of you. Thank you so much for this post! It definitely brought a smile to my Thursday!!! My favorite is Tolkien’s!!!! Glad you liked it! And yes, Tolkien’s is an apt one to end the list with given recent world events! That freaking kitty. I’m squealing. I thank the Lord that I’ve been blessed / With more than my share of happiness. I like the Oscar but am drawn to the Helen Keller. I’m in a hard won happy place at the moment and her words mean something to me. Hear, hear – I love Keller’s words of wisdom too. Good post; my last blog was also about “happiness”! Made me happy to read these quotes, especially after a nice discussion on happiness in my writing group this morning. How marvellous! Happy (belated) International Day of Happiness! Reblogged this on Halley Does. Such a great post!! Happy, happy, happy International Happiness Day!! The cat is fabulous and makes me smile. What a wonderful face. All cats are perfect so it’s no surprise that I fell in love with this one, but s/he’s smiling so contentedly…adorable. I know – I’ve seen the picture before and when I was looking for the perfect picture to accompany this post, I stumbled upon it again. A lovely cat! I enjoyed all these quotes and really agree with George Elliot….so much to be happy about if you have it in, or make it your nature at any age. Thanks, Susan – I agree, the Eliot one was too good not to include! The cat says it all. Live Long and Prosper should be added. Reblogged this on Read It & Weep. I truly agree! Will reblog this. Am happy that you decided to post this! Love the quotes and have fallen in love with the smiling cat. Thank you!